The Hurricane Weather Research and Forecasting (HWRF) is increasingly becoming known for its better performance in simulating tropical cyclones (TCs) over different basins globally, and the Advanced Research version of the Weather Research and Forecasting (WRF) model is widely used for the same in both research and operational settings. These two models are now operational at India Meteorological Department (IMD) for TC predictions over the North Indian Ocean. The near real-time forecast of HWRF and WRF models is evaluated in a quasi-operational setup based on 62 forecast cases from 10 recent TCs during 2013–2017 over the Bay of Bengal. Multi-satellite estimated winds are used to compare initial and simulated vortex structures, and HWRF has been found to be better. The track prediction is comparable in both the models for shorter forecast lengths (up to 30 h), while the HWRF is skillful (by 27%) for longer forecast, thus leading to a better estimation of landfall position and time. HWRF is significantly better (error < 10 knots) in intensity prediction compared to the WRF model (~ 15 knots). 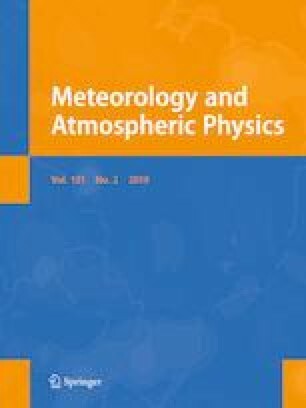 Unlike the WRF model, the HWRF model produced an improved vertical structure of dynamic and thermodynamic processes and could be attributed to the state-of-the-art vortex initialization and relocation method, multiscale interaction and high resolution. The model-predicted vortex structures also supported the credibility of HWRF system. This work highlights the need for having improved initialization and high resolution for TC predictions over the region. This work is supported by the financial grant from the Indian National Centre for Ocean Information Services (INCOIS), Ministry of Earth Sciences (MM/SERP/CNRS/2013/INT-10/002), India and the Indo-US Science & Technology Forum (IUSSTF), New Delhi. KKO also acknowledges the financial support from SERB (ECR/2016/001637), Department of Science and Technology (DST), and, Earth System Science Organization, Ministry of Earth Sciences (MoES/16/14/2014-RDEAS), Government of India. DN acknowledges NSF CAREER AGS-0847472 grant. The IMD provides observed track, wind speed for validation of model simulation results and we thank their efforts. Mr. Naveen G is also acknowledged for his help in improving the readability of manuscript.